An underwater digital music player and a hi-tech baby gate are among inventions on show at Brunel University this week. Showcasing the work of Brunel's final year design and technology students, the inventions promise a wide range of solutions to both practical and social problems. Students at Brunel's department of Information Systems and Computing have come up with a computer package designed to combat the growing problem of child obesity. The computer program tests children on their awareness of sensible eating habits and rewards them with computer games if they reach high scores on the test. Student Tasneen Sattar has been looking at ways of improving web usability for dyslexic surfers by designing improvements such as colour coded indexes, site maps on the homepage and a browsing history of where a person has visited recently. And an automated hacker that searches for weak spots in a website and produces a full diagnosis of security problems could prove invaluable for busy firms worried about viruses. "As in previous years, the show this year has some fantastic projects, many of which could make a real difference to our lives and the way we use IT," said Tim Cribbin, a lecturer at Brunel University and show organiser. There were also some fun gadgets on show, such as a digital music player that can work underwater. Student Sam James came up with the idea during his work placement when he was visiting the local swimming pool a lot. "I got quite bored just swimming up and down," he said. 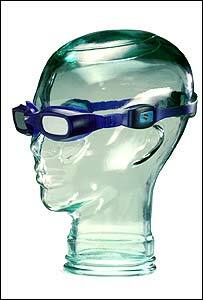 The music player is integrated into swimming goggles and uses bone conduction to vibrate music direct to the skull. The sound quality is actually better than in a normal environment because there is no background noise. Mr James picked up an innovation award from sponsors AOL and a cheque for £1000. Research firm Newland Scientific has shown an interest in developing the gadget commercially. "As well as recreational uses it has all kinds of applications, such as a communication device for swimmers or deep-sea divers," said Mr James. For parents, an automated baby gate that keeps children safely behind bars while letting parents pass could prove a useful addition to the house. Inventor Liz Lelliott explained that her designs are inspired by existing items that need improvement. "Parents told me that conventional gates have a dangerous bottom bar that they can easily trip on," she said. Her design eliminates this and height-sensitive sensors allow adults to pass without having to fiddle with the gate itself. Even adventurous toddlers will not be able to set off the sensors as they are specifically designed for only adults to pass. And women the world over will be thanking Ella Kilgour, for her simple yet effective invention. 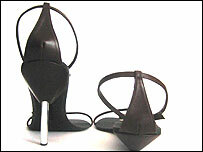 She has come up with the ultimate in fashion and comfort - the collapsible stiletto heel.